Does God speak to us in multiple ways, including audibly? 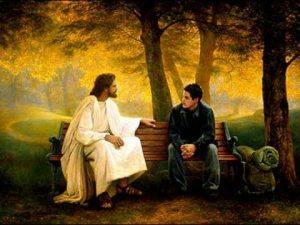 *Note* This is part 2 of my post, Does God Speak Today? Read the first post here for the background to the current one. After looking at the Bible, it makes a lot of sense to come to the conclusion that God does, indeed, speak to us. The question is, how does he speak to us? God speaks, primarily, through the Bible. I say “primarily” because it is the method God uses the most. In fact, every time someone picks up the Bible God is speaking. That’s because God is the ultimate author of the Bible. Christians believe that the Bible was written by regular human beings, but at the direction of God. In some cases, God spoke audibly and directly to a person who then wrote down exactly what he heard. For example, in the Old Testament prophets, we often read a line like, “This is what the Lord says,” or the iconic King James way of putting it, “Thus sayeth the Lord.” God spoke and someone wrote it down. Other parts of the Bible were not written like this. Some parts of the Bible were written by compiling historical records, such as the ones referenced in 1 Kings 14.29 (“As for the other events of Rehoboam’s reign, and all he did, are they not written in the book of the annals of the kings of Judah?”). Also included might be the historical sections of the Torah (first 5 books of the Bible) which may have been compiled, in part, by Moses as he wrote the history of God’s people. Still other parts of the Bible were written by the author without any direct, verbal word of God or any historical record. The New Testament epistles, for example, include theological teachings that were new and different because the people of God were experiencing a new reality in the Church age. They do not claim that God spoke audibly to them but they are claiming the authority of God. 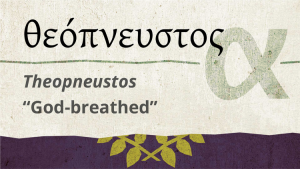 No matter which method God used with each author, what the Bible teaches is that all Scripture is “God breathed” (2 Timothy 3.16) and therefore functions as God’s word. By God breathed, we understand that God, through his Holy Spirit, carried along each author such that they wrote using their own personality and style, yet were enabled to write without error. This is why Peter can claim in 2 Peter 1.20-21 that “Above all, you must understand that no prophecy of Scripture came about by the prophet’s own interpretation of things. For prophecy never had its origin in the human will, but prophets, though human, spoke from God as they were carried along by the Holy Spirit.” It doesn’t matter which method God used; each writer has written not their own ideas about God but, rather, God’s true words. This is why Paul can claim in 2 Timothy 3 that the whole of the Bible is useful to teaching, rebuking, correcting, and training for righteousness. Since the Bible is, at its heart, a collection of God’s words, we hear from God every time we read it. But that is not all that makes it primary. It is the primary method of hearing from God because it is the most sure method. By this, I mean that it is the most trustworthy method. Because these words were written down and carefully copied and passed on to all geographic areas of the world and across time into the present day, and because they have been attested to by the Church from the earliest days until now, we can have confidence that the words we read today are (translations of) the very words God wanted us to read. The Bible, then, serves as the measuring stick of all other forms of hearing from God. Any time you need to hear from God, pick up the Bible and read it. You will hear from him. He is speaking to you. The Bible is not a dead book. It is alive and active (Hebrews 4.12). It is actively working on us and in us to change us. Hebrews says it divides between soul and spirit. The Scripture helps us think rightly about God, corrects our faulty beliefs, inspires our imaginations, and engages our hearts in the great epic of God’s relationship with his creation. The Bible leads us into relationship with the creator of the universe. Much more can be said about the Bible, but let us consider additional ways to hear from God. For ages, the Church has taught that God not only speaks through the Scriptures, but also directly to us as we listen to him in prayer. Prayer is, at its most simple, talking to God. But we often think of talking to God from only one perspective – we talk to him. But in every other instance, we use the phrase “talk to _____” to mean that a conversation is happening. You talk, she talks…both listen to the other. But many in the Church no longer expect this to happen. Before I go on, let me acknowledge that once you begin to accept that God can speak privately to someone in prayer, there are many opportunities for bad things to happen. Someone can lie about what God has said to them and use it as an excuse to do something they should not or compel someone else to do something they should not. A person could be deceived, thinking God is speaking to them when he is not – or worse, when an evil spirit is. There is no doubt that errors and evil can and have been perpetrated by people claiming to hear from God. If God is speaking, there is nothing we can do to stop it. Our denial of God speaking doesn’t change the truth. This potential for error always been there, even before the Bible was written. In fact, it was more dangerous then than it is now, because now we have the Bible to judge the claims of God speaking. It’s safer now than it was before! Once we accept this idea, then the question of “how?” remains. I’ll try to answer in regards to the “mechanics” of this and then from the perspective of judging if it truly is God speaking. The Church has a long tradition of listening to God in prayer. David models in psalm after psalm the process of going to God, asking him a question, and quieting himself in the presence of God until God answers. In Psalm 13, David asks God, “How long, O Lord? Will you forget me forever?” Then he makes a demand for God to answer him. He asks a question and then expects an answer. The psalm ends in praise, and we don’t know precisely what God spoke to him. But this pattern of speaking to God and expecting an answer is repeated time and again in the Psalms. One famous example of listening to God in conversation like this is Brother Lawrence, a Carmelite monk in the 17th century who shared about his practice of talking and listening in the book The Practice Of the Presence of God. He said, “There is not in the world a kind of life more sweet and delightful than that of a continual conversation with God.” But other examples of this abound. Eric Liddell, of Chariots of Fire fame, was both a gold medalist in the the 1924 Olympics and a missionary to China where he died in an internment camp during the Japanese occupation. In his book fo rnew believers, The Disciplines of the Christian Life, Liddell encourages his readers to ask God about the tasks set before them that day and see if God would want to add or subtract from the schedule. His suggestion is to write down the things that come to mind and let God direct the path for the day. No “wild charismatic,” this devout Presbyterian believed that God speaks. Each of these examples have one thing in common. None of them were expecting an audible voice – not that God can’t speak that way. They were believing that God would speak to them in their own minds and by impressions and nudgings from the Holy Spirit. If God truly dwells within us (1 Corinthians 3.16), he can interact with us and impact us. I believe that this happens more than we even realize. Most Christians have had an experience like mine. They were just going about their day when, out of the blue, a person pops into their head along with an urgency to pray. Later, after talking to that person, I heard about a trying circumstance that was overcome or that God intervened in. That was the Holy Spirit speaking to me on behalf of another. I’ve been awakened in the night with a sense of a need to pray. I don’t know why, but I began to pray with the understanding that God had woken me up. Other times, I have been called on to pray for another person but didn’t know what need they had. I asked God what to pray for and then began to pray. All of the sudden, the person broke down in tears. Afterwards they told me that that what I had prayed was a response to the exact thing they had been worried about. These are not rare occurrences when we begin to take the possibility (or the reality) of God speaking to us seriously. And I do not see myself as particularly adept at hearing from God! Stop and listen. Quiet yourself in the presence of God, even if the world around you is not quiet. Note any thoughts, impressions, images, or other responses. Pay special attention to things that don’t seem like you. But note any thoughts. Resist the temptation to judge at this point. Just write it down/reflect on it. Ask for more. Now measure it against God’s word. Is it in line with the Bible? Does it conflict? Does this sound like Jesus or God as found in the Scriptures? Even if it isn’t in opposition to God’s word, hold it lightly. Remember that you can get it wrong. This is not inspired Scripture, just an impression or a sense. Thank God for speaking to you. Share it with mature believers who can give insight and counsel to you. Repeat, repeat, repeat. This is how, over time, the sheep learns to hear and know the shepherds voice (John 10.4, 14-16, 27). 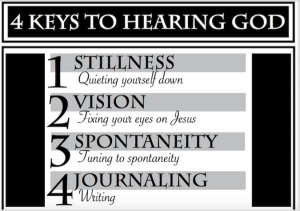 A simpler version is Mark Virkler’s 4 Keys to Hearing God. But is it really God? Couldn’t it be your own voice, or even demons? Well, I don’t know if God spoke to you or not. But I do know this. On many occasions, I have taken time to listen to God and I heard something. Sometimes it was a single word. Other times it came in complete sentences. Still other times I saw images, still or moving. Never once have I personally felt like I heard from God and came away with anything that was against Scripture or contrary to the revealed will of God. Not once did I walk away feeling hurt or uncared for, and never has anyone responded that way when I shared it with them. Probably over half of the time it is Scripture that comes to my mind, while other times it is direct and specific to my situation. Let’s reflect on this, starting with the times it is Scripture that you hear. If you ask God something and Scripture comes to mind, you know God is speaking. Either he spoke to the reminder of the Scripture you thought of, or at minimum that passage is God speaking to you through the Scripture. I don’t see a downside here. Who cares if you thought of that on your own? God is still speaking. And there is no way that a demon is going to answer you with a healthy application of Scripture. That said, Satan did try to lead Jesus astray using Scripture while Jesus was fasting in the desert (Luke 4.9-11). This is why you need to be a student of the Bible if you want to be able to respond as Jesus did, recognizing that Satan was twisting the Bible for his own ends. We’ll come back to this. When it isn’t Scripture, but just an image or word or sentence that you get from God, how do you determine who it came from? Let’s be honest. Sometimes you will not know. If it matches up with a healthy reading and application of Scripture, you’re still on good grounds. If you hear something like, “I love you and cherish you,” then you are on good grounds, because God let’s us know in the Bible that he loves and cherishes us (Romans 5.8 and Zephaniah 3.17 are but two of many examples). If you hear God saying, “You need to stop this sin and return to me in obedience,” then you are on good ground also. This is especially true if you don’t feel judged by this (there is no condemnation in Christ Jesus – Romans 8.1) but rather invited back into the loving presence of God. In contrast, if you hear, “You are worthless! Why can’t you just follow me like you’re supposed to?” Well then, you have a problem. That goes against the entire Bible’s example of how God seems to call his children back in repentance. Likewise, God won’t encourage you to commit sin. But what about those tricky demons? I find this rebuttal to be ironic to the extreme. Many, many Christians believe that demons can influence their thoughts and implant ideas in their heads. If demons can do this, why couldn’t/wouldn’t God do it? And if God does it, why are you more afraid that demons will trick you than you are trusting that God will protect you? Who is better at communicating with creation, anyway? Sure, people are led astray. But I find that it is hard for this to happen when people humbly follow the steps outlined above. If you heard from God, and every mature believer around you is telling you that you’re off (and maybe even showing biblically why you’re off), then chances are you didn’t hear from God. And there’s no shame in that. You were wrong. Lesson learned. Move on as a more mature and wise person. 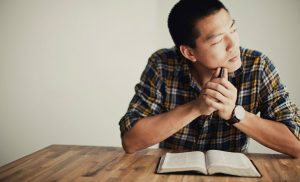 In contrast to listening to God in prayer, which I believe every Christian can do, some believers hear from God through words or images (both examples are in Scripture). This can even happen when they are not trying to hear from God at all. It just happens. What makes prophecy different, in my mind, is that there is a spiritual gift of prophecy (and we could add the gift of knowledge and wisdom here) where God speaks to certain believers in what appears to be a more direct way, or a more clear way. Often, these thoughts feel less like impressions and more like unmistakable interventions. I do not have this gift, but as a pastor I have seen it at work. I’ve seen someone share that God told them about a prayer need and then someone present had that need and then God intervened in prayer for that person. Sometimes the intervention has been a physical healing. At other times, it has been an emotional or relational need. I’m still in awe when this happens. At other times, there is a word of encouragement or challenge for our congregation. Again, I’m still amazed at how often this relates in direct ways to something coming in the sermon, but which the person sharing had no knowledge of. But God knows. When a prophetic word comes, the Church’s job is to evaluate it (1 Corinthians 14.29). This evaluation can happen on an individual level and a group level. It depends on where the prophecy is shared and may depend on the potential impact of that prophecy. Sometimes, I question whether God was really at work when a prophetic word is shared in our church service. In most of these cases, what was shared did no harm even if it wasn’t from God. In those cases, I tend to just let it go. At other times, the impact is greater. Then, an intervention is needed. Now, I admit that as I write this I wonder if maybe I should intervene every time I feel that the word might not be from God. As a pastor, I’m also keeping in mind the potential fallout of calling out a person or people over and over. Here are the potential negative outcomes. As people and communities grow in maturity and health, these things are less and less likely to happen. Either way, if what is shared could have a damaging impact on others, it definitely should be challenged. But be careful not to see the inherent difficulties and then decide to ban prophecy! Many more times than there was a problem, we were blessed by a challenge, an encouragement, or direction given by God. More times than not, what was shared was not only right in line with Scripture but it also revealed something that we had not seen previously. These things are called gifts for a reason. If God ever speaks to you out loud or shows up in a burning bush, pay attention. My sense is that this type of thing does not happen often. But it has happened and there is no reason it cannot happen again. If you experience this, thank the Lord and then do whatever he told you to do. But remember, God will never tell you to do something in person that contradicts or goes against what he has told you to do in Scripture. So use discretion as you would in any other circumstance. I pointed out in the last post that God also speaks to us through nature (which includes science), through other believers, through dreams, and more. There are even examples in the Bible where Paul quotes insights from other philosophies and religions. As it has been said, “all truth is God’s truth” so we can take it from any source in which we find it. In each of these examples, what is necessary to avoid error and the trap of acting out in self-deceptive ways (just saying what you want to hear and then putting God’s name on it) is to have a strong relationship with Scripture and other believers. God does not intend for these things to happen in isolation. We need the written and sure word of God and the wisdom of Christians who have experience with God and the Bible to keep us in line. We need to be humble about our experiences and understand that we can have wrong perceptions. Our perceptions can also cloud our reading of Scripture. These wrong perceptions can stem from as diverse a set of reasons as our lack of historical knowledge and background, our sinful desires to hear the messages we want to hear, or lack on ability to read well. Since God does not only speak through the Bible, we should not limit ourselves only to the Bible. We should listen to him in every way he chooses to speak to us.